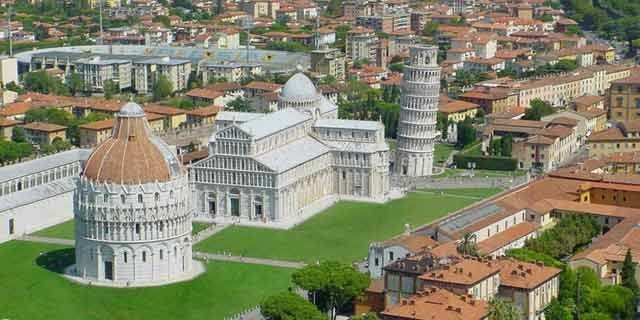 8.87-hectare (21.9-acre) area located in the extreme northwestern part in the city of Pisa, Italy. architectural complexes in the world. The Piazza dei Miracoli contains four famous architectural masterpieces: the Pisa Cathedral, the Pisa Baptistry, the Leaning Tower, and the Camposanto Monumentale (Monumental Cemetery). Santo Spirito (New Hospital of the Holy Spirit), which houses the Sinopias Museum and the Cathedral Museum. In 1987, the Piazza dei Miracoli was declared a UNESCO World Heritage Site. Begun in 1063, the cathedral is a masterpiece of Romanesque architecture. It includes various stylistic elements: classical, Lombard-Emilian, Byzantine, and Islamic, drawing upon the international presence of Pisan merchants at that time. The main architect was Buscheto, who is buried in the last blind arch on the left side of the facade. The facade itself was built by Buscheto’s successor, Rainaldo. The rich exterior decoration contains multicolored marble, mosaic, and numerous bronze objects from the spoils of war. The interior, subdivided at the front into a central nave flanked by two side aisles on either side and with the transept and apse in three naves, is covered with white and black marble, with monolithic grey marble columns having corinthian capitals. It has a wooden 17th-century coffered ceiling, painted and decorated with gold leaf, made by Domenico and Bartolomeo Atticciati; it bears the Medici coat of arms. Presumably the earlier ceiling was a structure with wooden trusses. A disastrous fire in 1595 destroyed most of the cathedral’s medieval art, but some of the best Renaissance artists were hired for the redecoration work. smaller and simpler than the present one, is now kept in the Camposanto, in the Aulla chapel. The Baptistery, dedicated to St. John the Baptist, stands opposite the west end of Pisa Cathedral. Construction on the Pisa Baptistery was started in 1153 by the architect Diotisalvi and was completed in 1363. It is the largest baptistery in Italy, it is 54.86 meters (179.99 feet) high, with a diameter of 34.13 meters (111.97 feet) and a circumference measuring 107.25 meters (351.87 feet). The Pisa Baptistery is an example of the transition from the Romanesque style to the Gothic style: the lower section is in the Romanesque style, with rounded arches, while the upper sections are in the Gothic style, with pointed arches. The Baptistery is constructed of marble, as is common in Italian architecture. the font, is a work by Italo Griselli. Dedicated to St John, the walls display artworks depicting various stages of St. John’s life and there is a piece depicting Christ between the Madonna and St. John, surrounded by Angels on the upper storey. (185.93 feet) on the high side. The width of the walls at the base is 2.44 m (8 ft 0.06 in). ground too soft on one side to properly support the structure’s weight. The tilt increased in the decades before the structure was completed in the 14th century. It gradually increased until the structure was stabilized (and the tilt partially corrected) by efforts in the late 20th and early 21st centuries. Prior to restoration work performed between 1990 and 2001, the tower leaned at an angle of 5.5 degrees, but the tower now leans at about 3.99 degrees. This means the top of the tower is displaced horizontally 3.9 meters (12 ft 10 in) from the center. represents one note of the musical major scale. There are 294 steps on the north side and 296 steps on the south side of the tower. The Campo Santo also known as Camposanto Monumentale (Monumental Cemetery) is located at the northern edge of the square. back to Pisa from the Fourth Crusade by Ubaldo de’ Lanfranchi, the archbishop of Pisa in the 12th century. after the bringing of the soil from Golgotha, and was erected over the earlier burial ground. 1360, the last about three centuries later.